Photo by Carolonline. Some rights reserved. CHILE — Five Mapuche activists are entering the fifth week of an “open-ended” hunger strike at Angol Detention Center in the country’s Araucanía region. Community member Daniel Levinao Montoya called the hunger strike after he and Paulino Levipan Coyán were convicted by a military court in mid-August. The men are protesting the militarization of their land in Chile’s south and calling for the release of all Mapuche political prisoners. The two activists were arrested in connection to a November 2011 shooting in Chequenco that left three members of the national police wounded. The court ruled the shooting was predetermined and sentenced both to 10 years for attempted murder, along with another year-and-a-half for possession of firearms. Levinao and Levipan, whose attorney plans to appeal the convictions, are both in their late teens. In their fifth message to supporters, the strikers include a chart of their weights before the strike and two weeks in. According to Prensa Latina, community leader Nibaldo Huenuman’s statements to the site indicated the young men “suffer physical deterioration, have lost about 10 kilograms … and can barely stand up.” Despite significant weight-loss and general poor health, the men remain steadfast in their commitment to the strike and have refused hospital treatment. The action is the third hunger strike to be carried out by Mapuche activists in three years, following two strikes in the summer of 2010 and spring 2011. Current strikers have not received the same level of media attention as those in years past, but all three actions have targeted a common enemy: Pinochet-era anti-terrorist legislation that is used almost exclusively against Mapuche community members. An incident in April left police sergeant Hugo Albornoz fatally wounded. Albornoz’s injuries were sustained during a firefight that began after police raided Wente Winkul Mapu. According to witnesses, police were searching for evidence related to an October 2011 attack on a nearby private estate. Two months after Albornoz’s death, Erick Montoya Montoya was beaten and sustained buckshot wounds before police arrested him in connection to the crime. At least five members of Montoya Montoya’s family were also assaulted by police; the victims ranged in age from 12 to 78-years-old. The remaining strikers – Rodrigo Montoya Melinao and Héctor Ricardo Nahuelqueo Nahuelqueo – were arrested on charges related to the April attack. Montoya Montoya and Montoya Melinao await trial in Angol while Nahuelqueo, 19, was released on parole. While their comrades count the hours until their own days in court, both Levipan and Levinao were tried under the anti-terrorist law, known as Chile’s Law No. 19.027. A hangover from the country’s 17-year military dictatorship, the law makes it possible for civilians to be tried in military courts and, in the event that they are not convicted, may be subject to double jeopardy in a civilian hearing. No. 19.027’s power stems from its adaptability. The legislation redefines “terrorism” to include property violence or attacks on corporate employees and allows for the use of anonymous witnesses to convict suspected terrorists. Until recently, anonymous witnesses were not allowed to be cross-examined by the defense. Mapuche community members argue the law and its provisions usurp due process and criminalize the group’s struggle. Daniel Melinao, a spokesperson for Wente Winkul Mapu, argued in a speech at a Mapuche Ceremonial Center in Viña del Mar that the sentences were discriminatory and racist. “It was police who testified before the judges and they did not show any paper, antecedents or medical paper showing that they had even a scratch, pellet wound or whatever,” Melinao told the crowd. At least four people have died in what the Chilean government has dubbed the Mapuche Conflict – three Mapuche and one national policeman. Some sources cite a higher figure. Only one of those suspected of killing the Mapuche victims was tried and the court did not convict the alleged assassin. 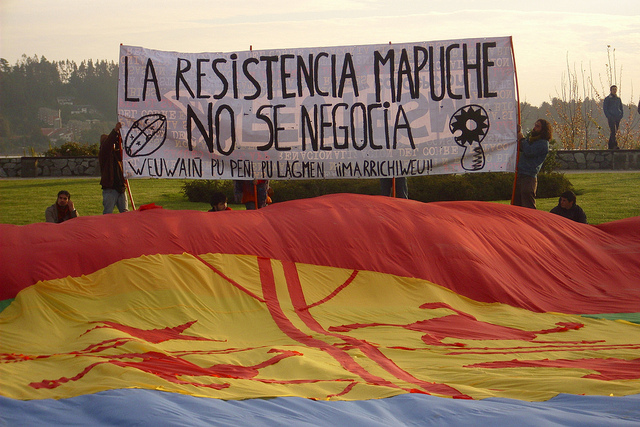 Resistance to repression has a centuries’ long history in Mapuche communities. The Mapuche staved off incorporation into the Inka Empire and their lands constituted the southern border of Inka territory. European would-be colonizers met a similar fate. The Spaniards were only able to extend the colonial project as far south as the Bío-Bío River after a protracted battle with the Mapuche. 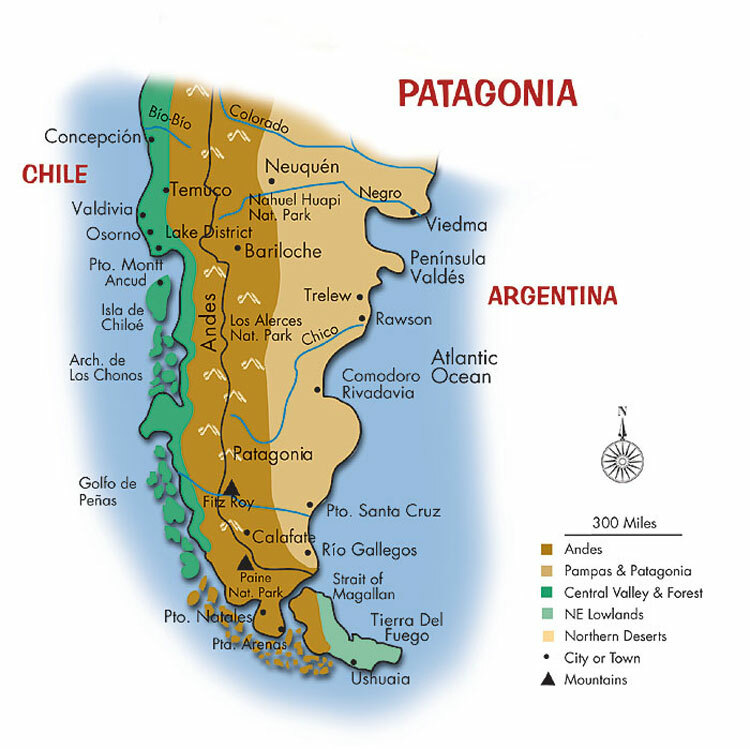 The indigenous territory south of the River was one of the last pieces of South America to be incorporated into a modern nation-state in the 1880s, when Chilean forces finally began colonizing the region a full 60 years after declaring independence from Spain. Free from the repression of Pinochet’s military since Chile’s return to democracy in 1990, activists began to engage in increasingly radical actions in the struggles for freedom of speech and affordable education. Mapuche militants are no different in this respect. Legal land occupations and apolitical cultural centers were cast aside in favor of forceful land reclamations, anti-police actions and anti-corporate violence. Uprooting industrial crops and replacing them with foodstuffs became common practice in some communities in an effort to reclaim ancestral Mapuche lands from private and corporate interests. And while the Mapuche focus on local issues, radical Chilean student movements are addressing Mapuche issues and incorporating the Mapuche struggle into their battle with the Sebastián Piñera administration. In its manifesto, the student movement demanded an increase in scholarships for indigenous students and the inclusion of course content relative to indigenous languages and histories. At the 39 anniversary memorials of the 1973 military coup that ousted the democratically elected Salvador Allende, marchers called for freedom and justice for the Mapuche, marking a shift in the way indigenous identity is imagined from an urban perspective. The Mapuche are a powerful piece of urban Chilean national identity and imagination, and after a mass migration from the south to cities like Santiago, a tangible part. Over half of all people who self-identify as Mapuche live in urban settings (44% in Santiago alone), while more still have Mapuche lineage. In rural indigenous communities, support came in the form of solidarity strikes. Mapuche activists expressed unity with the five incarcerated youths and began a hunger strike on August 25, after 30 days of occupying UNICEF’s Santiago office. According to TeleSur, the occupiers were occupying to protest the “passivity” and “lack of support” for Mapuche youth targeted by the government’s violence and criminalization of the struggle. Organizers suspended the strike after UNICEF representative Tom Olsen agreed to meet with the occupiers. Amidst the shows of support from around Chile, the young hunger strikers announced their own list of demands. The Aug. 29 communiqué from Angol asks for the annulment of the sentences of both Levipan and Levinao and freedom for all Mapuche political prisoners; the demilitarization of Mapuche territory; an end to the use of protected witnesses in Mapuche cases and the return of land to indigenous communities.